Aiden Whitaker, a pastor at NCF Church, shares his heart on prophecy at an NCF staff meeting. 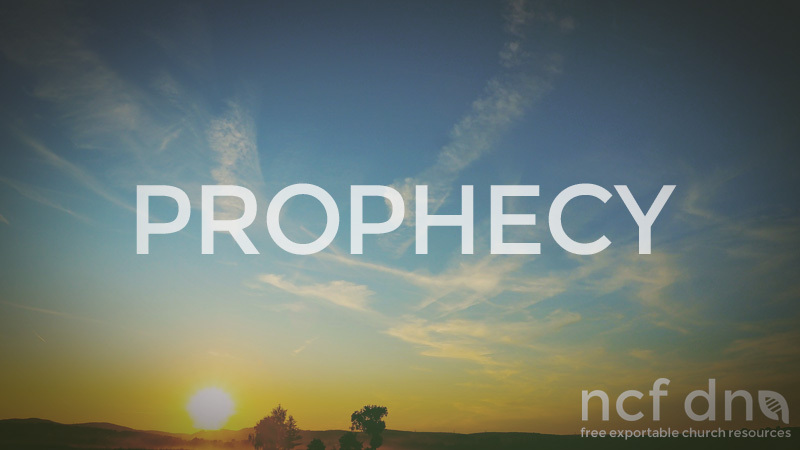 When it comes to prophecy in the Bible there are 2 elements that help us understand what it is; that of “foretelling” and “forth-telling”. Foretelling deals with speaking about something that is going to happen in the future whereas forth-telling has to do with speaking or proclaiming the truth in the present. For most people when they think of prophecy their immediate thoughts have to do with speaking or telling the future. Now many biblical prophets did speak about the future and what would be, thus foretelling God’s message and plan to man and there is that element of prophecy today that concerns speaking about what is in the future, but a large majority is speaking the truth of God in the present. Hebrews tells us that God sustains all things by the word of His power and very often a prophetic word carries us into the future, rather than tells us what the future is. Sometimes we find ourselves clinging to a prophecy from 6 months ago that sustains us in the current season. Why? Because we serve a God who is forever speaking and He wants to speak to us about our present as well as sustain us and carry us in our future. In my own words, I believe that prophecy is God revealing his heart and purposes to someone through another individual. This means a prophecy will never break you down. It will always build you up in the faith. Prophecy in its form will always be the truth in love and prophecy in it’s expression will always be faith expressing itself through love. Love is the most important ingredient, i believe, in prophecy. Love for God and His Word and His people. God revealing his heart and purposes to someone through another individual in order that through faithful expression of love they are strengthened, encouraged, and comforted and as a result the church is edified. Note: Very often you can be unsure if the word you want to share is from God or made up by you. If your heart is to love on and edify then share that word with faith because more than likely it is God revealing His heart and purposes through you. 1 Cor 14:1 encourages us to eagerly desire the spiritual gifts especially that of prophecy, revealing Paul’s belief is that prophecy is available for the church – he was writing to the Corinthian church, not addressing just the prophets! Also Joel 2:17-18 points out that prophecy should be a mark on the life of a son or daughter or servant of God filled with His Spirit. Therefore If your faith is in Christ and you are filled with His Spirit then prophecy is for you. God wants to speak to you for you, but God also wants to speak to you for someone else. Prophecy is then for you “for you” and also for someone else “through you”. We live in a very self-centred “all-about-me” world and this can easily creep into the church where it’s all about me and Jesus, about me and my prophetic word and future, about what God is saying to me. In my understanding prophecy in the Bible is always about God speaking a message through His prophet for someone else. Prophecy is for you and through you. 1 Corinthians 13:9 speaks about us seeing and prophesying in part. Why is this? I believe it is because 1 we are fallen, 2 prophecy is subjective and 3 prophecy should cause us to run to Jesus. We are fallen. We get it wrong. Think about it: God speaks a message through us and just maybe we don’t hear it right or just maybe in our excitement we add to it. So when God gives the word there is a breakdown in communication, not in God communicating, but in us hearing. Therefore it is only part of the word. Prophecy is subjective. You get a message from God and you interpret it and share it with someone who in turn subjectively interprets it. The source is pure and unbroken, but by the time it is heard and interpreted on different levels, the word is in pieces. We also only see in part, because our communication with God is not perfect. So imperfect people who subjectively speak God’s message is God’s idea? Why? Prophecy should cause us to run to Jesus. Jesus is the ultimate fulfilment of prophecy and the parts and fragments we see and deliver should always cause us to run to Jesus who is the full picture in order for us to understand. In Jesus are the parts fulfilled and put together! Prophecy in itself is not only God speaking, but God drawing us deeper into relationship with Him. In Jesus all parts make sense and it is Jesus who helps us remove the subjective man elements and see and hear His heart and purposes. Don’t put out the Spirit’s fire and don’t show contempt. This means no matter who shares it, honour the word. Every prophetic word has the distinct possibility that God wants to speak to you; even if the messenger is faulty. Every prophetic word also has the distinct possibility that a fire will be ignited in your heart that will draw you closer to Jesus. Don’t put it out. Honour it; write it down, record it, think about it, pray about it. Test it. Find the good and leave the bad. How do we test it? Test it with the word of God – Jesus will never tell you something that is not consistent with His word. Look at the fruit. Firstly, the fruit of the source of the word and then the fruit of the word. Jesus tells us that no good tree can produce bad fruit and no bad tree can produce good fruit. This can be applied to prophecy. Test the fruit of that person’t life. It doesn’t mean we judge the person sharing it, because we are all fallen, but ask yourself if what they say lines up with what they are living and now prophesying over you. Secondly, look at the fruit of the word. All prophetic words from God will cause you to run to Him. If a word brings condemnation and makes you want to run from God, then it is not from God. Test it by consulting Godly leaders and getting their perspective on the prophetic word. Ask someone you look up to in the faith to help you discern (remember it is ultimately about the Church being built up – therefore at every stage from sharing, receiving, to testing, the church and church relationships should be strengthened, encouraged, comforted and edified). Ask God for a word for someone (God is a creative God and therefore we shouldn’t limit how He can and will speak through us, and because prophecy is creative in nature the expression of the word shouldn’t be limited to just sharing a scripture. I am convinced the ear is a muscle; what you train and work will grow. The more we practice listening to God, the more we hear Him. Also I believe in the biblical principal of reaping what you sow. If you want God to speak to you in this way, then allow God to speak through you for someone else in this way. also the best way to hear God is to practice hearing Him for someone else. It’s about taking the focus off of self. 3. Speak and obey in faith. I am also convinced that like the ear, our obedience is also a muscle. The more we step out in faith, the more we will grow in being faithful messengers of God who reveal His heart and purposes to man whether it is about the present or future.